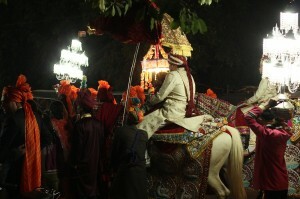 It is wedding season right now in the Rajasthan region of India. The first night we stumbled upon the pre-wedding celebration we thought we were so lucky to witness it! But we soon realized there would be weddings every night! They start with a lively marching band parading through the streets. Behind the band, family and friends circled up in male/female groups and danced the evening away. The women looked beautiful with their colorful saris. Each parade varied a little bit with its own unique flavor. Sometimes it was outlined by huge electric chandeliers that parade members carried on tall poles. In some parades the men threw flowers and flicked holy water on the family while women danced wildly (it seriously looked like they were having convulsions) with potted plants on their heads! Every once in a while important party members rode in the front in a carriage and once we spotted the groom on the back of a colorfully decorated horse. The parade continued to a venue where friends and family continued to party until the late morning hours. What a joyful way to celebrate! Wealthier weddings seem to end with fireworks and one night we watched three firework displays at the same time. Too bad we weren’t around longer; perhaps we could have made a friend and gotten invited to one! Arranged marriages are still the norm in India, with only the more cosmopolitan places, like Mumbai, becoming more accepting of people choosing their own partner. Unfortunately, child marriages are also still fairly common. We read that Hindus used to marry off their daughters at a very young age to prevent them from being raped by invading forces. Written by: kate on February 5, 2012.on February 16, 2012.